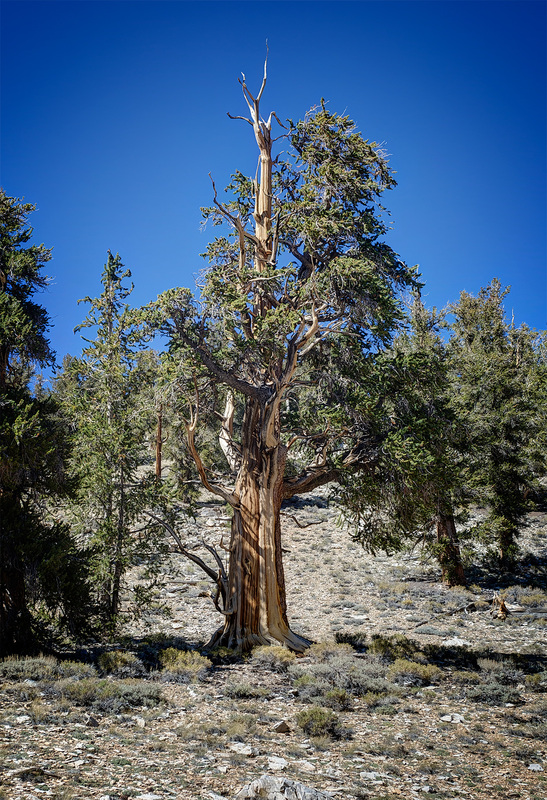 After leaving Great Basin National Park I’d resigned myself to the idea that it would be several years before I got to see the Bristlecone Pine I’d driven nearly a thousand miles to see. 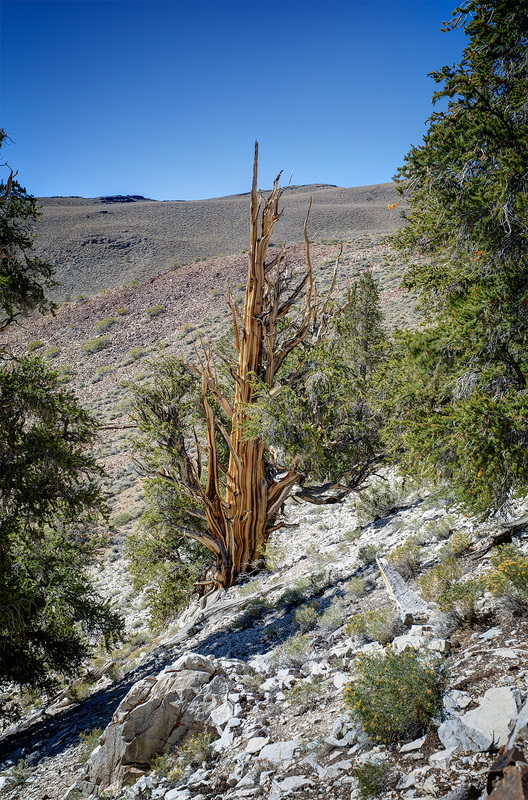 It was only by pure chance that I learned there was an Ancient Bristlecone Pine Forest just a few miles down the road from Mono Lake. I was talking to a fellow birder who was walking the camp where we spent the night and complaining that the rain had spoiled the first part of our trip. 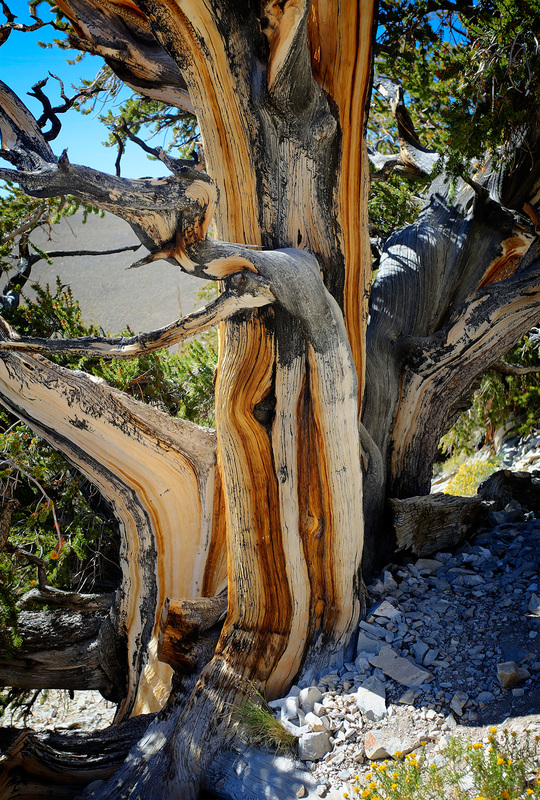 He said that the Ancient Bristlecone Pine Forest wasn’t too far down the road, easily visited in a day. Needless to say, it never crossed my mind that we wouldn’t visit the park. It was a long, slow drive from the main highway, but it was certainly worth the time spent. I’m sure I’ll return to the park to take the 4 mile walk that we didn’t have time for. Leslie and I found it challenging climbing the steep hill even on the discovery trail right outside the visitor’s center. A mile doesn’t seem very far, but at 10, 000 feet carrying camera equipment it took a lot longer than I expected, and I was winded by the time we started back down hill. Perhaps the only thing harder than climbing that hill has been editing all the pictures and deciding which are worth posting. Seeing this tree inspired me to make it to the top, especially since the trees seemed to get more spectacular as we climbed. 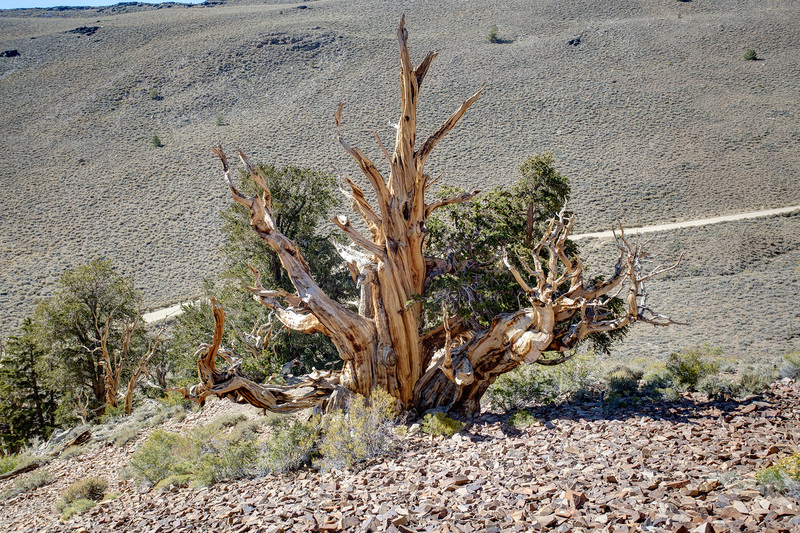 yet it seemed to be common trait on all of the old Bristlecone Pines we saw. All but the youngest of the pines showed the same pattern. Needless to say, the woodworker in me loved the patterns found in the trunks of these trees. but I was surprised to read that the smaller, more deformed trees were actually the oldest trees, that they tended to live longer than the taller trees. If that’s true, I wonder how old this tree must be since they live up to 5,000 years long. Perhaps the most magnificent tree I saw, though, appeared to be dead, or at least I couldn’t see any sign of foliage on it. Dead or alive, it’s a triumphant symbol of endurance. Once again, though, we ran out of time. 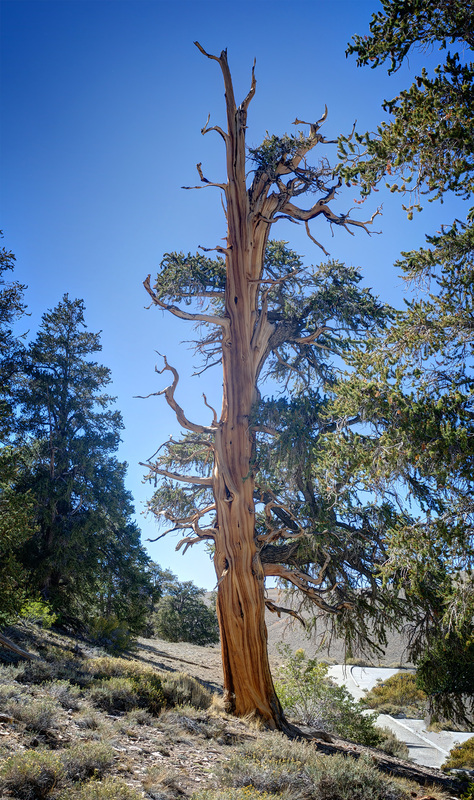 Next time I’ll camp at the top, get up the next morning and walk the 4 mile trail where the Methuselah tree is located before continuing on my trip. Oh, what art!! They are beautiful and the wood patterns on the trunks and the branches is truly an art form. Gorgeous!! So wonderful to see these photos of these ancient beauties. 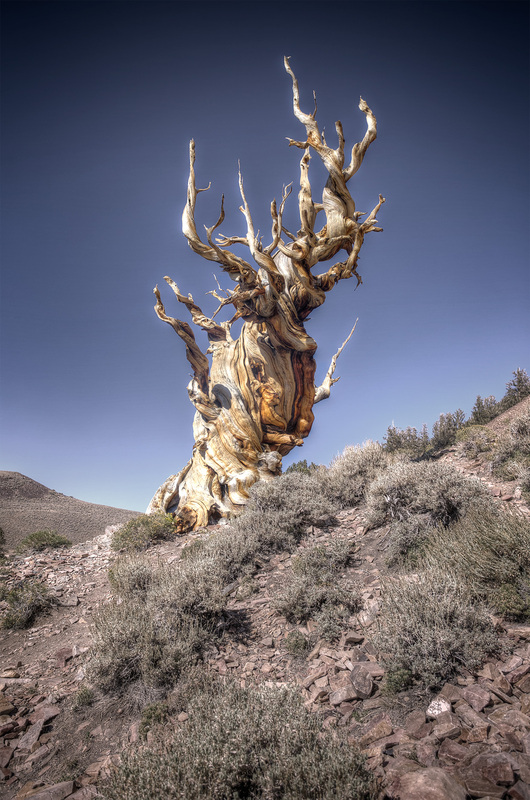 I don’t have a “bucket list” but if I did, getting to see a Bristlecone Pine would be at the top of the list. I’m so glad you went and took these photos. Thank you. Glad you both enjoyed it. I was really fond of them. They remind me of Bonzai; in fact they seem like the inspiration for Bonzai. Somewhere I read that there is actually a variety of Bristlecone Pine in the Klamath forest, which I think is relatively close to where you’re living now, if there’s a road that cuts across the mountains near you. I hope to gather more information and visit there on one of me next trips to southern Oregon/ Northern California. I’m going to have to do a little online research to see if I can find info on that variety of Bristlecone Pine in the Klamath Forest. That would be so wonderful, and so close! Let me know if you find an actual location listed. I found a map with green areas marked, but there was no way to see where the spot actually was. Here’s one of the maps I found. Is this more informative? There are some interesting links in this article that might have more detailed information. My niece is married to a forest service employee who spends a lot of time in the Trinity Alps wilderness. I may contact him for more exact information. I will send you what I find. That’s about what I found. I don’t think I could find the trees from those maps, though they might send you to a nearby ranger station that could offer more precise directions. You’re right, though, the article does give exact GPS coordinates to find some of the trees. I think with my new GPS and some downloadable maps that I could find several of the trees they discuss in the article.